This is the Numbers Game as played on the UK Channel Four tv game show CountDown. The game is simple, you select 6 random numbers, and attempt to reach a random target by adding, subtracting, multiplying, and dividing those numbers. The numbers used are four large numbers... 100, 75, 50, 25, and twenty small numbers... two each of the numbers 1 to 10. You can randomly choose from 0 to 4 large numbers, with the remaining numbers being small numbers. When you select your sixth random number, a random target number will be chosen (from 101 to 999), the countdown clock will begin, and you have thirty seconds to find a solution that equals the target number. Your solution must consist of any of your chosen numbers, the arithmetic operators +, -, /, *, and brackets. You only need to use as many of the six numbers as you need. It's not obligatory to use all of the numbers. During the thirty-second countdown, the application will attempt to solve the equation. If a solution exists, it will be found within the thirty-second duration (Exceptional cases might take slightly longer). If you think you've found a solution, you can stop the clock and the PC solution will appear as soon as it is available. 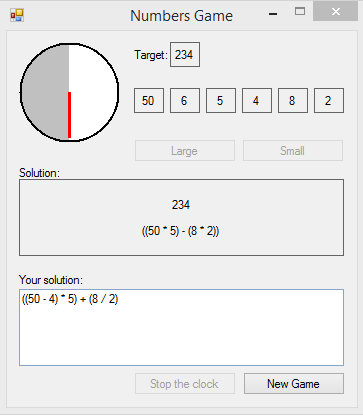 This is a difficult game to beat, but it is possible if you're quick with mental arithmetic.